So I have a baby on the way and was setting up the room and I was trying to figure what I was going to do with the walls. 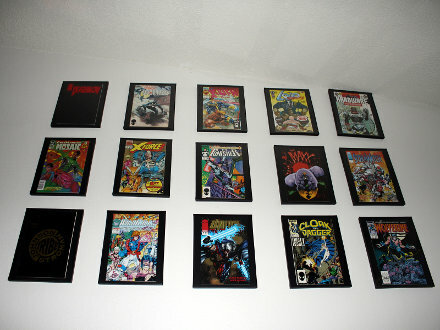 My wife came up with the idea to put up comic books on the wall because I like superheroes. So the first thing I did was do a Google search for, “comic book frames” and the first item that came up was, “Ikea Comic Book Photo Frame Hack | Youseph Tanha“. 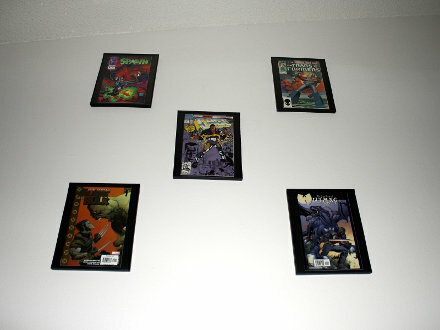 It detailed how Youseph used $1.99 frames from Ikea to add his comic books to his wall and it made a great look. I kept reading and he would put up updates on his readers using his idea. There was one update from Brilliantly Easy blog that said that Dollar Tree has $1 frames that they used to accomplish the same concept. This was perfect because I have a Dollar Tree and I went and found these, “Black Plastic Photo & Document Frames, 8½x11” and bought 20 of them for my project. All in all I am satisfied how my comic book frame wall came out and thank the wifey, websites and authors for the inspiration.